Dynamic Creative Optimization (DCO) is the automated process by which different display creative is served dynamically based on a variety of data points (think location, interaction history, demographics, etc.) and then optimized (served more frequently) to the better performing version. By understanding the viewer, we can deliver more personalized and relevant creative executions tailored to what we know about that individual with the goal being more engagement. In fact, we’ve seen that campaigns with DCO have up to 50% higher post-click conversion rates. 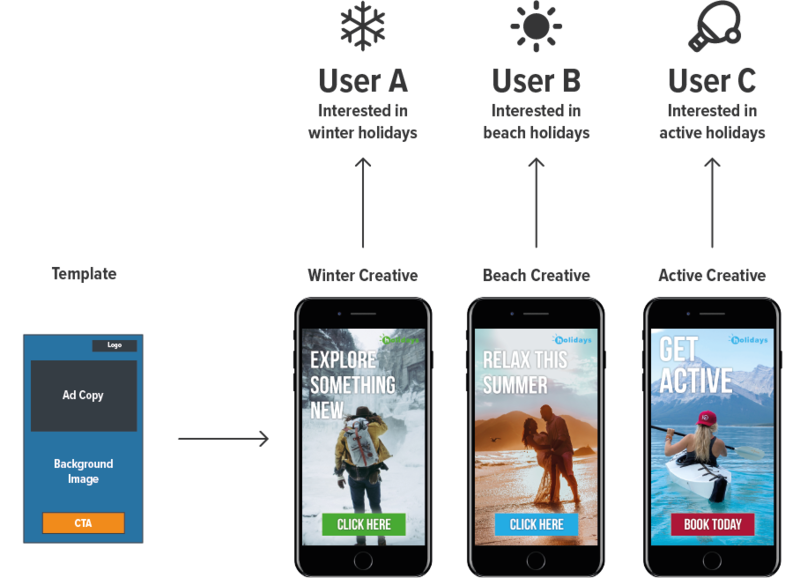 In addition to personalization, DCO offers the ability to test variations of the messaging and uncover additional insights on a variety of audiences. By understanding which audiences are reacting to each messaging set that knowledge can be fed back into the creative development and optimization processes. And DCO is a must for retargeting. An individual comes to your client’s site and spends time on a given page that includes specific products or content. A standard ad unit would hit them with the same product or visual and leave it at that. With DCO and available audience insights tools, we can identify a variety of demographic data (e.g., young NYC female) and serve ads that are more relatable (most popular products/colors) and in context with their lifestyle (urban). An ad’s images, call-to-action, message or can all be altered in the manner we choose in advance. Similarly, when running programmatic display or social, we may want to employ DCO to serve more personalized ads to predetermined prospects that have not yet visited. Modular-based creative execution that allows for easy swapping of images (even video) in a variety of sizes and messages is a great selling proposition for any creative agency. DCO requires multiple creative executions and the creative and media strategy must be in lockstep. What are the personalized data points that we want to consider (context, demographics, behavior, device, etc.) and how do we design effective test strategies (do we have enough for a statistically significant sample) to move prospects along the path we want them to take. The end result is a better ad experience for your client’s prospects and, more importantly, better insights and results. Working Media Group is a media planning and buying agency using data, insights and analysis to deliver transformative media solutions. NextNext post:Why is Attribution (Still) So Lame?